Spring has officially arrived, and that means it is time for Art in Bloom at the Museum. This year’s event runs Thursday, March 31 through Sunday, April 3 and includes old favorites and new surprises. This year’s event features the new Milwaukee’s Calatrava rose, bred by rosarian and Milwaukee native Bill Radler, and named in honor of the Santiago Calatrava-designed addition to the Museum. The intoxicatingly fragrant, double-bloom white rose will be available for advance purchase at the event, courtesy of Johnson’s Nursery. The festivities kick off at noon on Thursday, with the Art in Bloom Marketplace, offering gifts, accessories, and artful garden necessities. Throughout the day, the 41 designs will be professionally judged and the winners announced later in the evening during Cocktails and Blooms. At 6:15 p.m., horticulture expert Melinda Myers will speak in Lubar Auditorium. On Friday, the Museum opens at 10 a.m. and stays open until 9 p.m. Enjoy a full line-up of lectures and presentations all day, plus the Viewer’s Choice awards, floral-infused faire at Cafe Calatrava, and at 6:15, the Museum welcomes “You Grow Girl” founder and online celebrity Gayla Trail. Saturday includes more flowers and viewer’s choice winners, plus docent-led tours, lectures, food, and a special visit by award-winning author and illustrator Lois Ehlert in the Kohl’s Art Generation Studio. 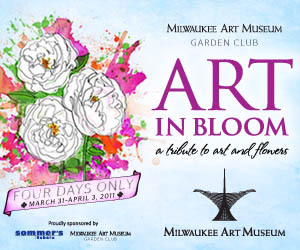 Art in Bloom closes on Sunday with another visit by Lois Ehlert, music from the Milwaukee Mandolin Orchestra, shopping, art, flowers, food, and more. For a complete schedule of events, and information on how to bring home your own Milwaukee’s Calatrava rose, please visit the Art in Bloom website. See you at Art in Bloom! This entry was posted in Art, Events and tagged Art in Bloom, Events, Family Programs, Gayla Trail, News. Bookmark the permalink.